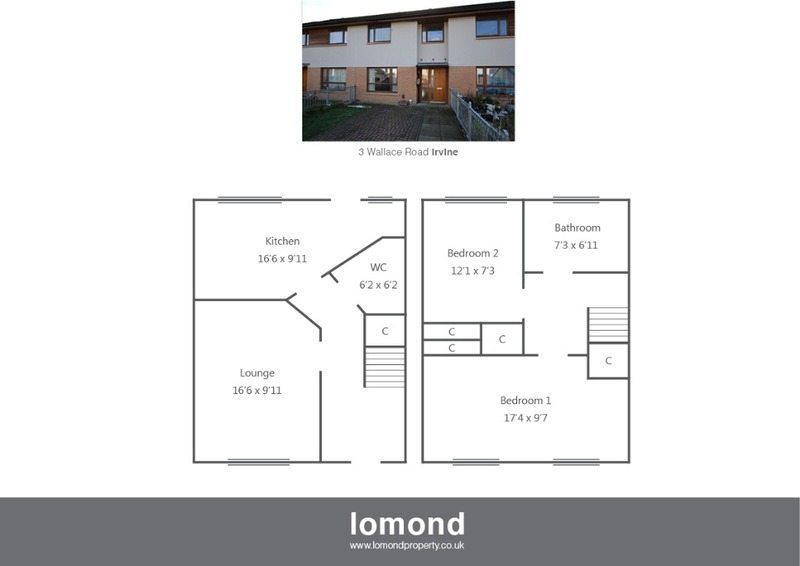 3 Wallace Road is a modern mid terrace villa offering excellent family sized accommodation over two levels. The property boasts two double bedrooms, with family bathroom, downstairs WC, dining kitchen and spacious lounge. Externally there are gardens to the rear, and off street parking to the front with electric charging point (suitable for electric cars). In summary the property layout extends to a spacious entrance hallway with stairs to the upper level. The ground floor comprises large front facing lounge with feature fire, and stylish décor. To the rear the dining kitchen is well stocked with floor and wall mounted units, free standing electric hob, and oven. A WC with WHB completes the ground floor. The upper level houses two double bedrooms, and a family bathroom. Each bedroom comes with fitted cupboard/wardrobe space. The bathroom comes with bath, over shower, WC and WHB. Externally the property has grounds to the side and rear. There is off street parking to the front with electric charging point. To the rear the garden is south facing, laid predominantly to lawn with timber shed. Wallace Road is a pleasant residential area. Irvine town is close by and provides access to a range of amenities including supermarkets, bars, restaurants and town centre shopping. There are a number of local primary and secondary schools within the greater Irvine area.